As we mentioned a few days ago, the Official FIP 2018 Calendar has already reserved the dates for the Qualifying Rounds dispute to the XIV World Padel Championships, a World Championship to be held in Paraguay from October 28 to November 4. Remember that all the Federations or National Padel Associations wishing to participate have already sent their pre-registrations before February 15 and the definitive registration must be sent before March 15, 2018. The Male & Female National Teams that occupy the first 9 positions of the official FIP ranking by National Teams are already classified, along with the host country Paraguay. The six remaining places that will give access to the XIV World Padel Championships 2018 will be elucidated in the Qualifying Rounds. Technical Specifications and minimum Conditions are als enclosed and published. Any other benefit for the participating National Teams will be carefully evaluated. It will be accepted candidacies presented within March 20, in order to define the Host Cities and Clubs by March 30. Last week, President Daniel Patti, accompanied by Vice-Presidents Bill Stamile ( Canada ) and José Luis García Frapolli ( Mexico ), visited the head office of the Global Association of International Sports Federations ( GAISF ) in Lausanne, Switzerland, to receive the official certificate of “GAISF Observer” awarded to the International Padel Federation, directly from the head of Administration Mr. Philippe Gueisbuhler. 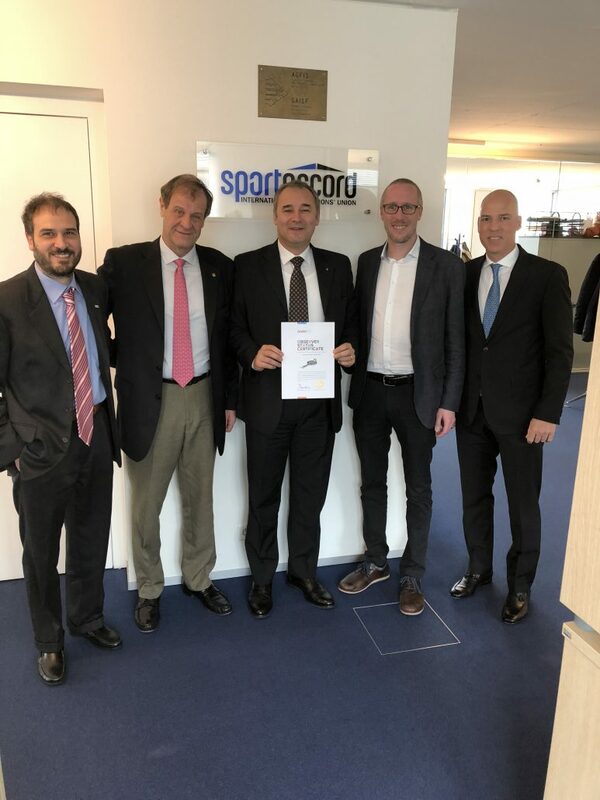 During the meeting, Vice-Presidents Stamile and García Frapolli had the opportunity to receive information directly, and to meet other GAISF and SportAccord staff members, as it was their first visit to their offices in the Maison du Sport International. The requirements that the FIP must meet throughout this period have been reviewed and re-evaluated point by point, and there is sufficient optimism from FIP Representatives that all requirements can be met before the expiration of the Observer Status period. One of the main functions will be carried out by the Vice-Presidents present with the help of the GAISF membership department, in order to obtain the necessary recognition of sport authorities required from each National Padel Federation and Association in their own country. Other institutional activities of great impact and importance will be conducted by the President and Board members. An important step in this process will be completed at the next edition of the SportAccord ( formerly known as SportAccord Convention ) and GAISF General Assembly, scheduled for mid-April where Representative of FIP will participate as Observer. 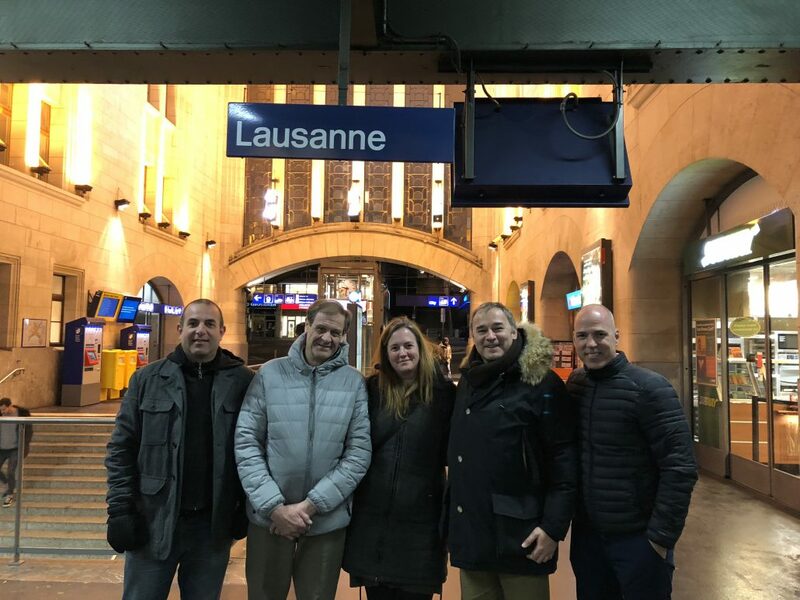 Lausanne was also a meeting place with the President of the Schweizer Padel Verband, Miss Claudia Bräm, and with the President of the Confederação Brasileira de Padel, Mr. Eduardo Langer. Every occasion is a good time to come together, to encourage and strengthen our growth. The first tournament in London is just 4 weeks away so in order to enjoy a discounted entry fee, and to protect and maintain your hard-earned UK points please ensure that you have renewed your British Padel Annual Membership before this first event. Ranking points will expire if you do not renew in the next 4 weeks. 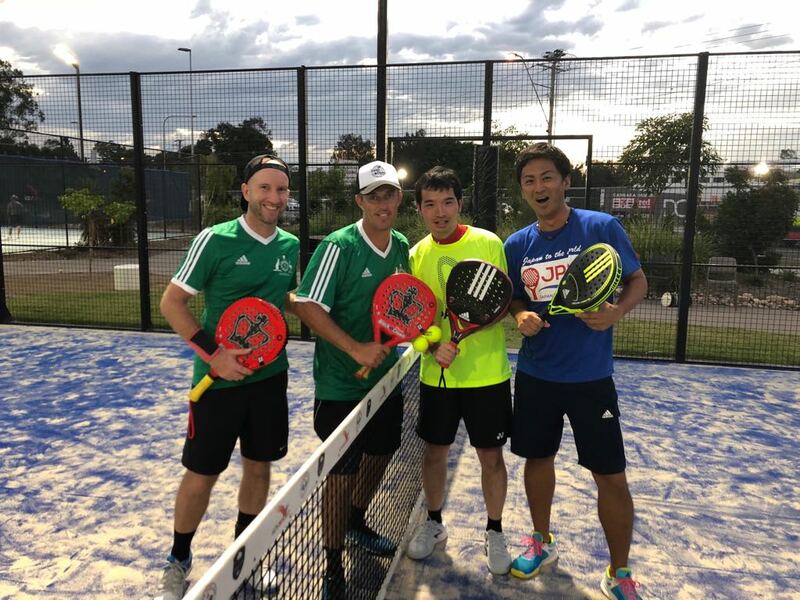 This past weekend, Saturday 10 and Sunday 11, was held in Queenland, Australia, the 2nd Asian Padel Tournament, a friendly match between the National Teams of Japan and Australia. After the first edition that took place in Thailand in 2017 and that faced Thailand and Japan, in 2018 it was time for 14 Japanese players, 8 men and 6 women, to pack their bags to travel to Australia, where 14 local players were waiting for the celebration of this important friendly event between the two National Teams. On Saturday 10 and before the start of the matches, the opening ceremony of the event took place, where the President of the APF ( Australian Padel Federation ) Mr. Matt Barrelle warmly welcomed the japanese players. At the same time, the President of the JPA ( Japanese Padel Association ) Mr. Koji Nakatsuka appreciated his words and stressed the importance of this international friendly meeting for the growing development of padel in Japan. After the parliaments it was time for the photos with all the members of the event. Subsequently 4 male pairs and 3 female pairs from each country faced each other on the courts of the Padel Gold Coast club. The victory in all the matches was for the Australian National Team, although in each match it was possible to see the great evolution of the players of the Japan National Team. 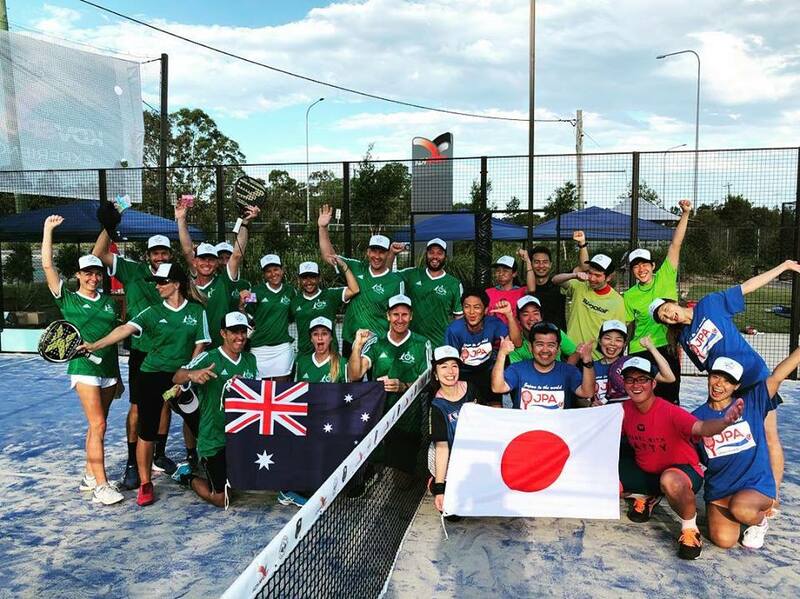 On Sunday 11, there was a series of friendly matches mixing Japanese and Australian pairs, both male and female, where the good atmosphere and fun prevailed when playing with partners that are not played regularly. At the end of the day and to conclude the event the members of both countries wrote their messages in the respective flags of their opposing friends to obtain the memory to an unforgettable weekend. This 2nd Asian Padel Tournament was made possible thanks to the great work and joint effort of the two Asia Pacific Federations, JPA and APF, together with institutional support from the International Padel Federation. Undoubtedly, a successful event to continue building ties on a global scale and continue working for the international padel development. At the Assembly of July 12, 1991, when representatives of the Federations of Argentina, Spain and Uruguay met to constitute the International Padel Federation, they set some important objectives. Among them was the idea of a format for the World Championship, and also the intention to be recognized by GAISF. The World Championships have started in 1992 and has never been interrupted, this year we will have a new edition.  Well, after twenty-seven years of life, the International Federation of Padel, our beloved sport, has been granted the GAISF Observer Status. At the GAISF Council Meeting of January 24th, held in Lausanne, Switzerland, FIP request has been evaluated favourably and we have been granted the status of GAISF Observer. GAISF, the Global Association of International Sports Federations, is a not-for-profit association, composed of autonomous and independent international sports federations and other international organisations contributing to sport in various fields. GAISF Observer Status gives the FIP the right to attend the GAISF General Assembly and allows to take advantage of the GAISF network to grow and develop. The GAISF Observer Status has been designed as the first step in the path towards fulfilment of all criteria required for GAISF membership. We would like to inform you that the place of Punta del Este in Uruguay has not been confirmed by the local government authorities. Information of such a need for confirmation was indicated in Communication n.1, sent on 13/01/2018. The Asociación Amigos del Padel del Uruguay ( A. A. P. ) has made every effort to obtain confirmation of accommodation availability, and finally the offer that had initially been confirmed orally has not been confirmed in writing, and subsequently cancelled. As already mentioned, the FIP Champions Cup is a Tournament open to all Associate Members ( FIP affiliated National Federations and Associations ) and is an award for the Champions of the National Championships, National Circuit, National Ranking, or for which each Associate Member decides to award. The aim is for the FIP Champions Cup to be held every year, in the first few months, with the participation of the previous year’s Champions. The FIP Board of Directors is now back in the study and development of contacts to find a new venue for the 2018 edition that rewards the 2017 Champions, aware that it may be difficult to confirm this Championship in the early months of 2018. We hope that in the next few days we can give you definite confirmation about the 2018 edition, which could be disputed in the coming months. We would also like to inform you that the Punta del Este government authorities have expressed interest in hosting the 2019 FIP Champions Cup, in February or March 2019, and we have requested a formal and written commitment. Only in this way can we confirm the event in that city. 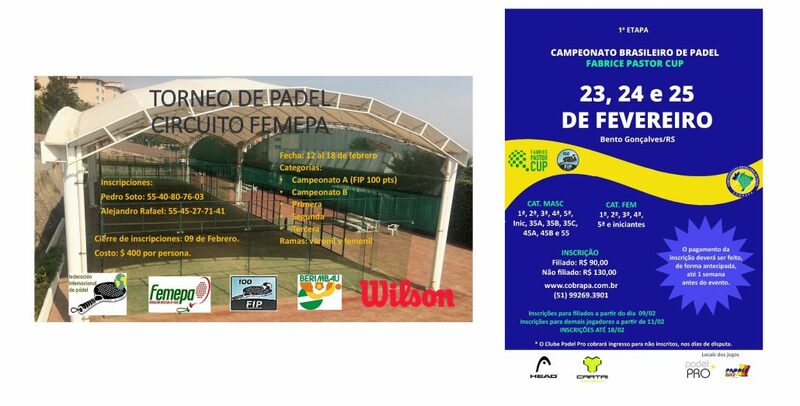 The First National Padel Association from Africa join the FIP! Another day that should be annotated in capital letters in the great agenda of the padel world. An historic day in which the first National Padel Association of the african continent is integrated as an Associate Member of the International Padel Federation. The Board of Directors of the Padel Association of Senegal is composed by Mr. Christopher Aime Chavane ( President ), Mr. Jordi Rovira Arimany ( Vice-President ), Mr. Nikolas Thomas ( Secretary ), Mrs. Marie Jose Gensse ( Vice-Secretary ) , Mrs. Llum Perez Barambio ( Treasury ), Mr. Laurent Auque ( Technical Director ) and Mr. Hamoude El Hadi ( Vice-Technical Director ). A mixed group of people from Senegal, France and Spain, who have lived there for several years. Due to local laws, the President must be of senegalese nationality. We know that there are several clubs in Senegal: in Dakar, Saly, Ngaparou and Nguering. 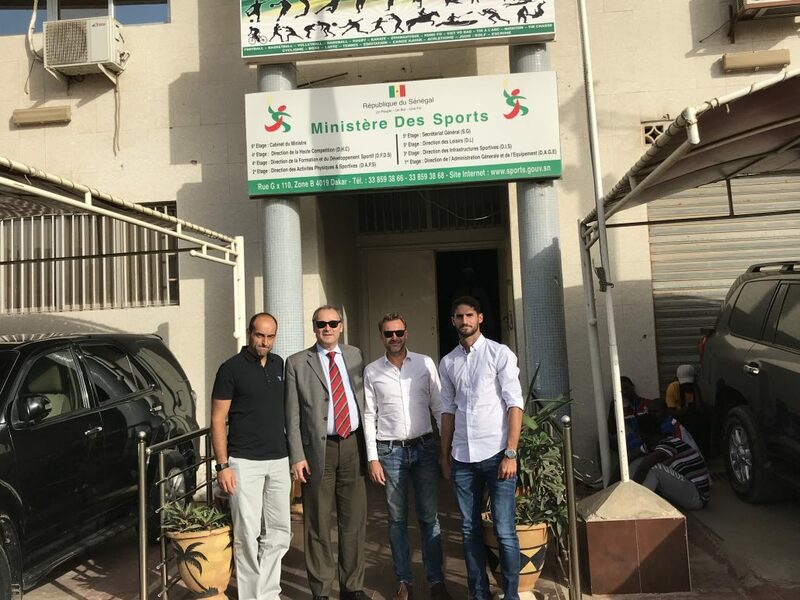 Senegal was waiting for this decision, to be able to include its players in the Official FIP Tournaments and Championships, so that they could have an Official FIP ranking, to organize Official Courses with the FIP Training School and to take some FIP Official Tournaments to Senegal. And indeed, the first FIP100 to be played on senegalese lands is already in the Official FIP Calendar 2018. Its Board of Directors is on site to have a structure in charge of the organization of the padel in the country, including existing clubs that are all affiliated, and initiating collaborative projects, with the assistance of local government authorities and the Ministry of Sport, with other African nations where the padel begins to be an interesting sport option and where there is already some infrastructure. The headquarters of the APS are located in Saly, about 80 km south of the capital Dakar. We are very happy to have a new Member with us, and especially the First Associate Member of Africa! 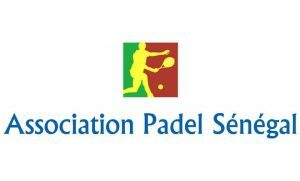 We warmly welcome the Association Padel Sénégal as our 35th Associate Member! http://www.padelfip.com/wp-content/uploads/2018/02/IMG_6845.jpg 3024 4032 padelfip_admin http://www.padelfip.com/wp-content/uploads/2017/11/FIP1.jpg padelfip_admin2018-02-06 19:10:102018-08-11 16:31:03The First National Padel Association from Africa join the FIP! A few days ago we informed you of the first National Teams to make their corresponding Pre-registrations to the XIV World Padel Championship to be held between October and November 2018 in the city of Asuncion, capital of Paraguay. The United States, Spain, France, Portugal, Switzerland and the hostess, Paraguay, were the first countries to send their pre-registrations for the great world meeting of the padel. In recent days, more National Federations have formulated the pre-registration confirming their intention to participate in the XIV World Padel Championships: the countries of Italy, Chile, Belgium, Sweden, Mexico, Poland, Czech Republic, Australia, Germany and Uruguay they add to the most relevant event on the planet. The Male and Female National Teams that occupy the first 9 positions of the official FIP ranking by National Teams are already classified, along with the host country Paraguay. In the FIP 2018 Official Calendar, the dates for the Qualifying Rounds have already been reserved, where the six remaining places that will give access to the 2018 World Championships will be decided. All Federations or National Padel Associations have the deadline to send their pre-registrations to the XIV World Padel Championships before February 15 and the final registration before March 15.